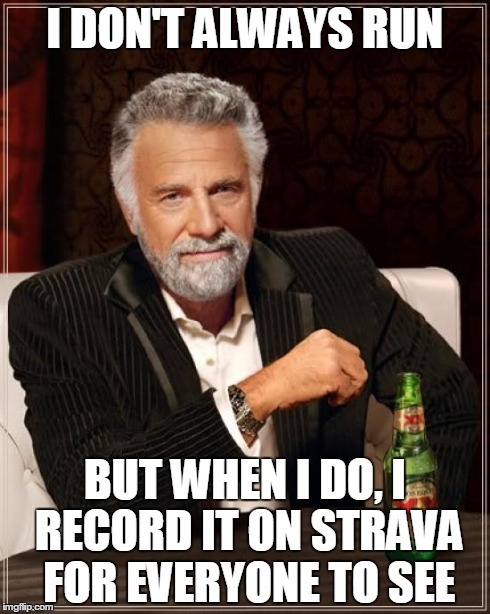 I have been using Strava for only a few weeks and already I feel that it has changed how I feel about exercise (it remains to be seen if this change is permanent). The instant availability of my speed and distance have a strangely motivating factor about them. I used to run for exercise (it was a chore). Now I run to improve my speed or distance – it’s even (just a teeny tiny bit) exciting. The additional motivation is great (if it lasts). 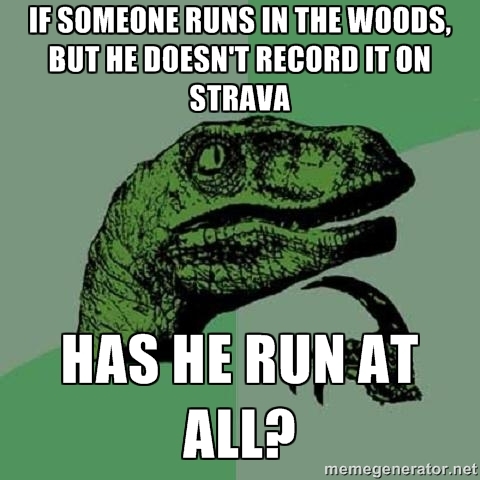 But Strava can also breed unhealthy obsession. Not long ago, during my run, I was interrupted by someone asking for directions. I had to stop and make a coherent reply for about 30 seconds. But in the back of my mind I was thinking: “this adding to my running time.” I would have been friendlier and given better directions had I not been distracted. And what if I don’t have my phone with me or my GPS doesn’t work or I forget to press record? Then the run has been wasted. There is no record of my effort, no little image of a trophy to mark my latest achievements. And no one will know, unless I tell them (I am not enough of an extrovert to do that). I’d rather have them see it on strava and casually remark on the how far I ran or how much closer I’m getting to some desired speed. This feature that other people can see my exercise results has had exactly the opposite effect from what I had expected: I thought I would feel very embarrassed at my extremely slow times (at least compared to my peers who run far more often than I do), that it would be demotivating. In fact, it has been very motivating. This entry was posted on 19/10/2014, 2:37 pm and is filed under thoughts. You can follow any responses to this entry through RSS 2.0. You can leave a response, or trackback from your own site. I don’t possess a smartphone so can’t keep track of my achievements with Strava, but used to list the duration of my swims/runs in a simple Word document. At some point, the file got corrupted and I am glad it did – because I had become obsessed with keeping track of myself. Now, I just go to the pool because I want to swim. And yes, amongst other things I exercise because it keeps me in good shape – but my main reason for going to the pool has always been that I like moving about, that I like the activity itself. Not keeping track of my results any longer has definitely helped me to enjoy my swims (and occasional runs/bike rides) more thoroughly. Besides that, I exercise because it helps me get away from the hustle and bustle of everyday life. If I’d keep track of my achievements, my exercising would still be part of this hustle and bustle – it wouldn’t be stepping away from it, like I do now. So, no ‘Track Changes’ for me.